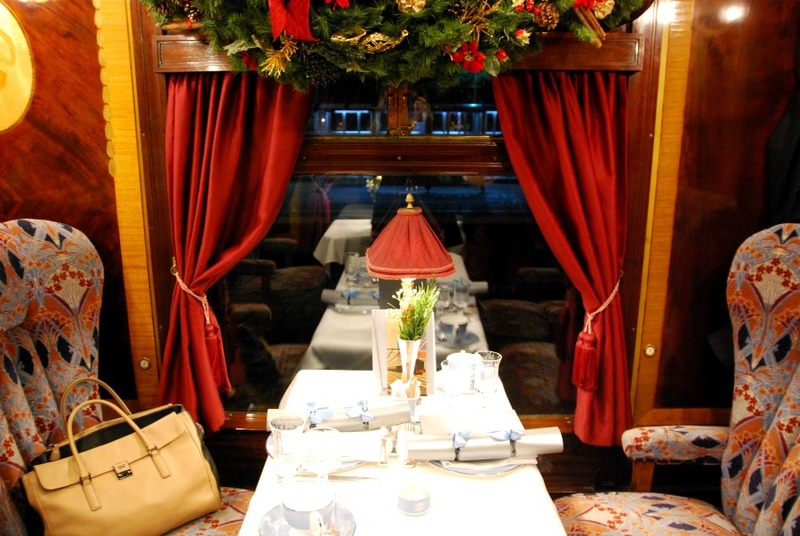 We had to head up early from Guildford as the train was leaving at 8:40am, but we arrived at Belmond's check-in office on platform 2 to freshly made cups of tea and the most adorable mini mince pies! 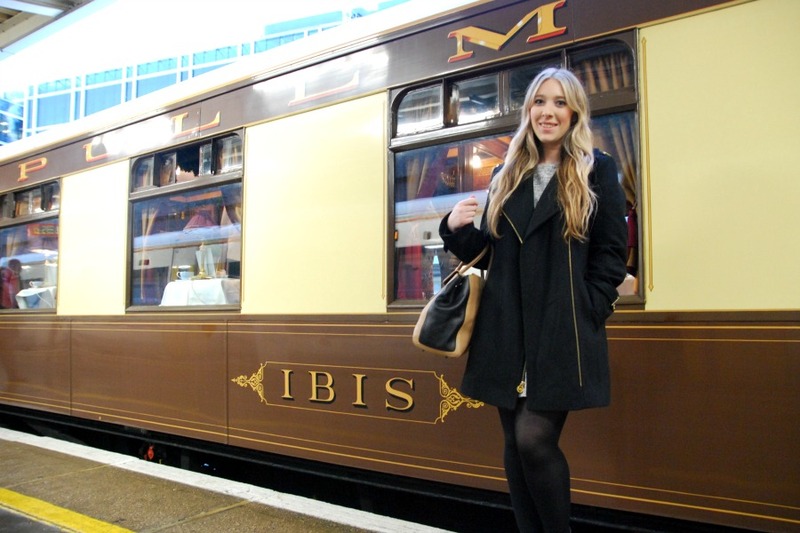 We checked in and made our way over to the train, getting a couple of photos before boarding our carriage - Ibis - which was made in 1925, which makes it the oldest carriage. 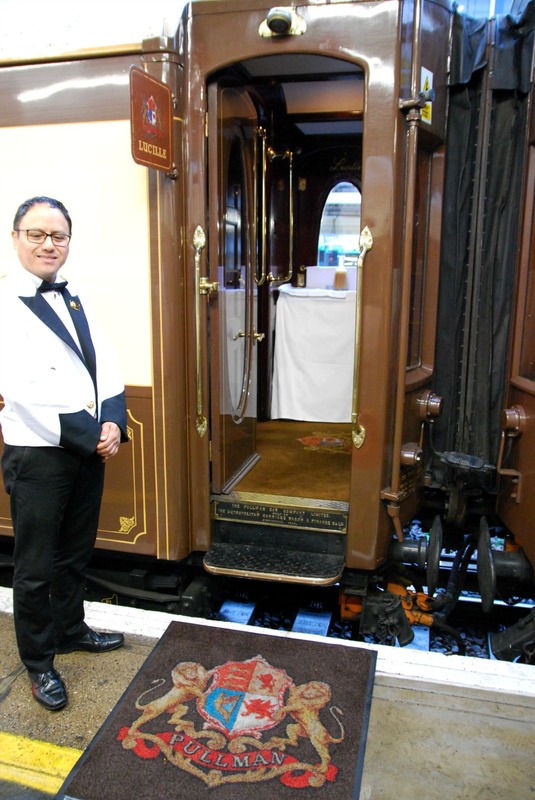 A red carpet greeted us at the carriage door, along with two stewards to help us aboard. 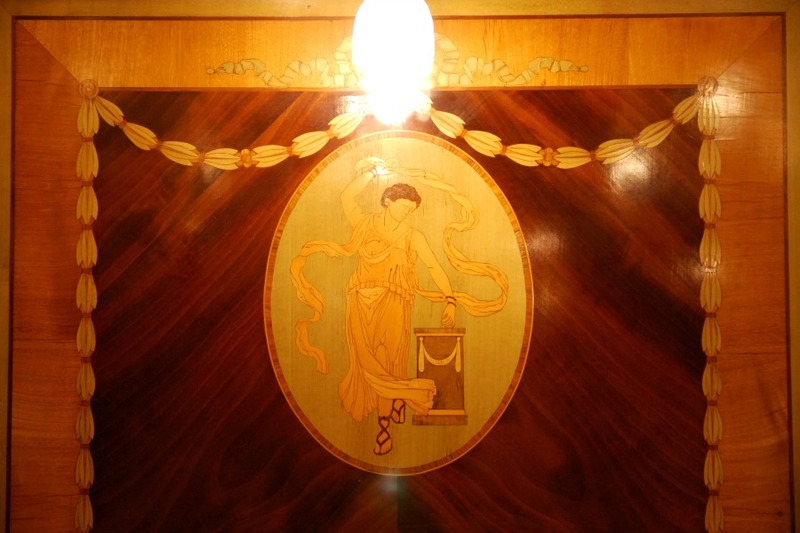 We were shown to our seats and quickly poured a glass of champagne while we got settled. 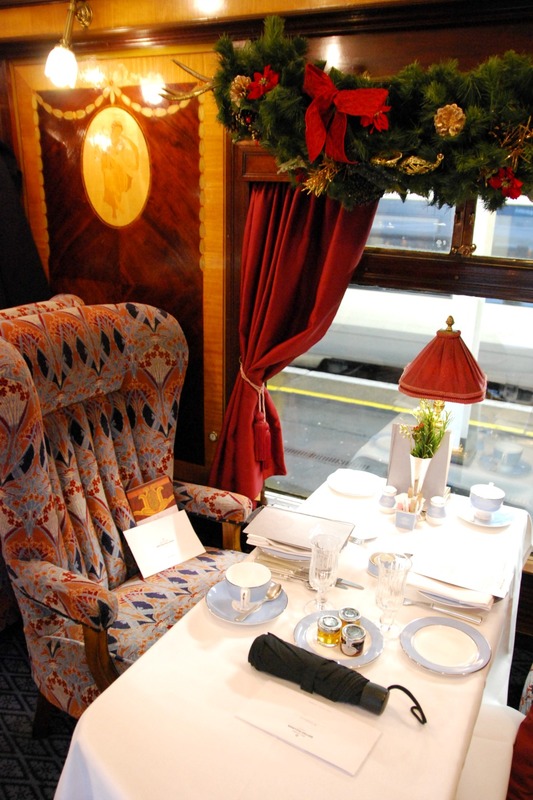 The carriage was stunning; the woodwork intricate and detailed, and the plush armchairs far prettier and more comfortable than the South-West Trains seat we'd been sat on an hour earlier. 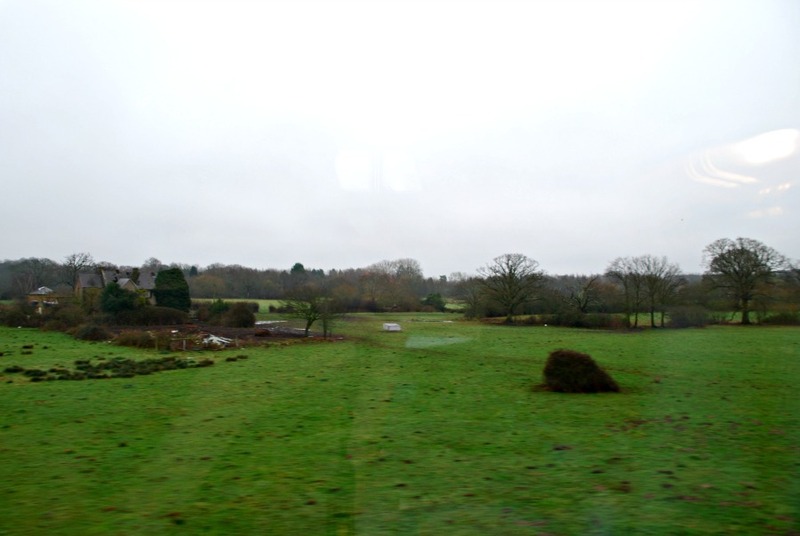 The train pulled away from the station and soon we were on our way through the outskirts of London and into the countryside. 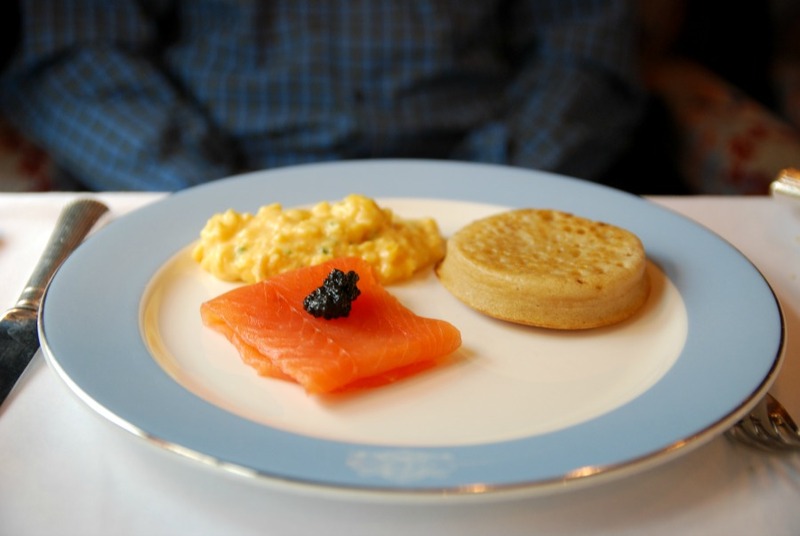 The stewards brought us Bellini's, and served us a breakfast of fresh fruit salad, pastries, crumpets, salmon (or ham for those who don't eat salmon), and scrambled eggs. I don't say this often as my own are pretty amazing, but he eggs were incredible! Super creamy and not overcooked at all. 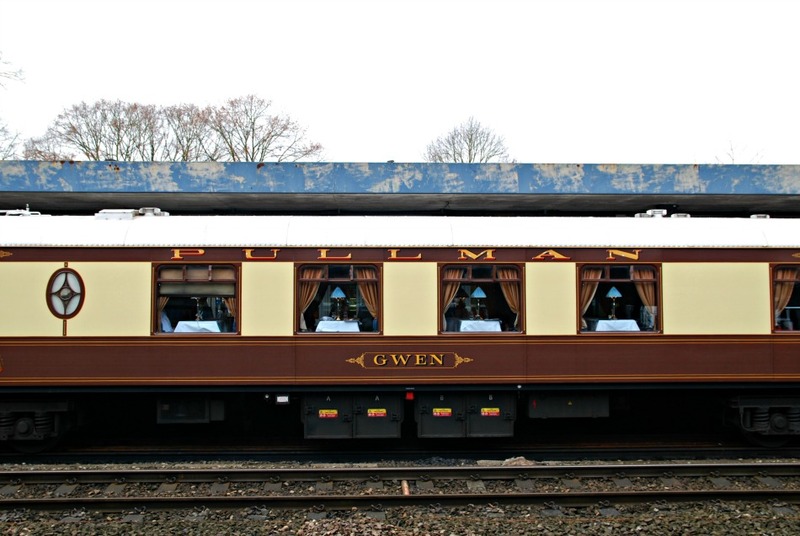 Dad and I had a wander down the carriages to see how different and unique each one was, and decided our favourites were Gwen, and Ibis, our own. 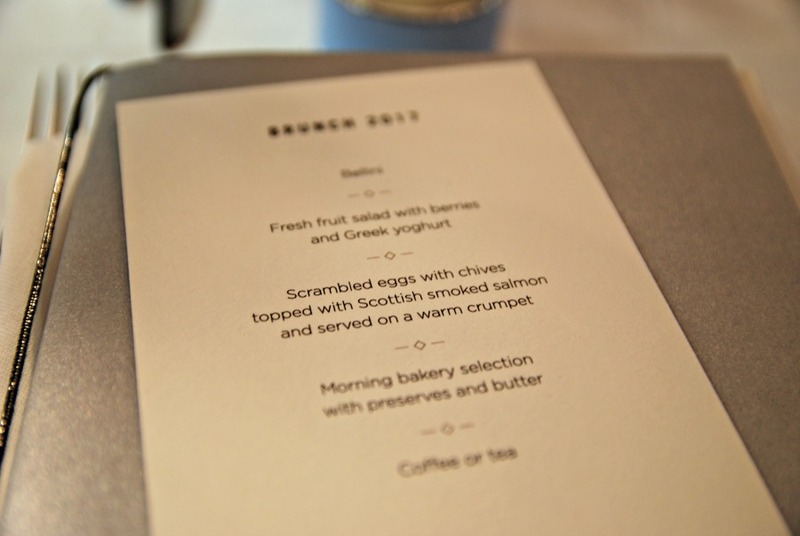 We tested out a few empty seats and discovered that each seat was just as comfy as the last, and then spent the journey catching up and chatting about my life in Australia, plans for 2018, and what I'd been missing at home. 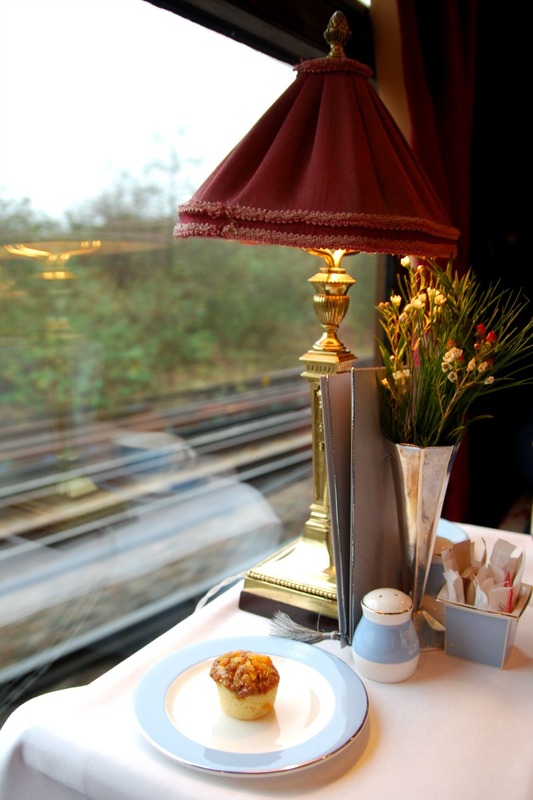 We continued sipping on Bellini's and watching the world go by (to be honest the scenery wasn't Britain's finest...just a head's up, a chunk of it was mine and my Dad's standard commute into London from Surrey), and before we knew it we were pulling into Oxford station. The staff were excellent and explained where we needed to go and escorted us all over to the coach across the road. 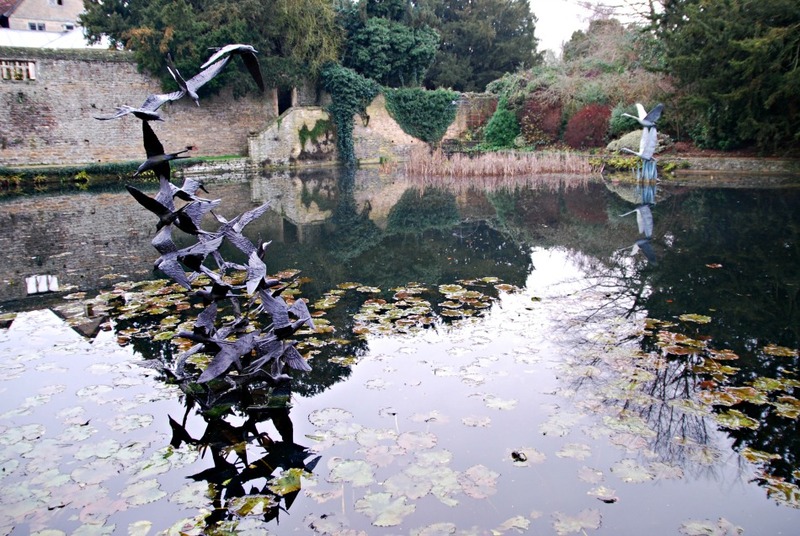 A 30-minute coach ride through the Oxfordshire countryside and we approached Le Manoir. We'd already been given our table number, so the staff took our coats and showed us to where we would be sitting at lunch. It had been a few hours since breakfast, so we were getting a little peckish at this point! 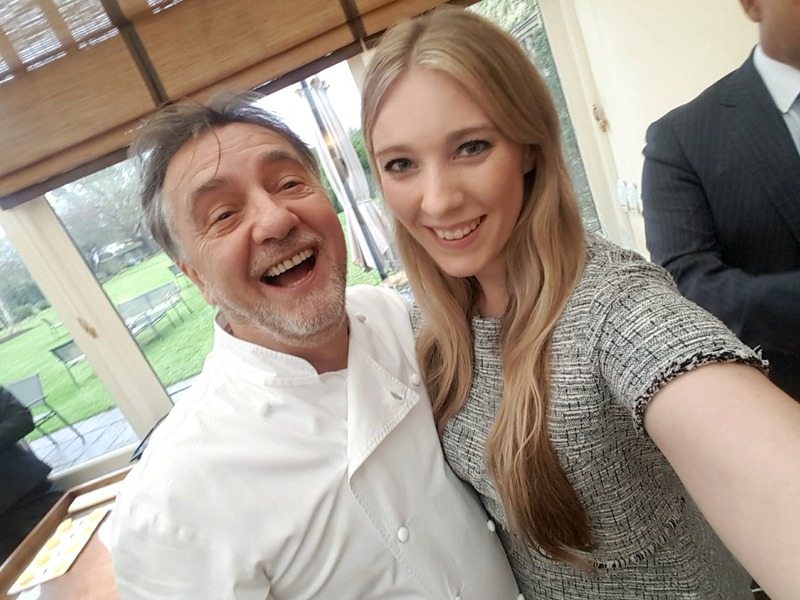 Also we had zero idea that Raymond Blanc was in the building or that we would even be meeting him, so were oblivious that he was in-fact in the kitchen!! Everyone was sat on large tables in groups, which Dad and I loved as we're both social butterflies who love a good chat with fascinating people. 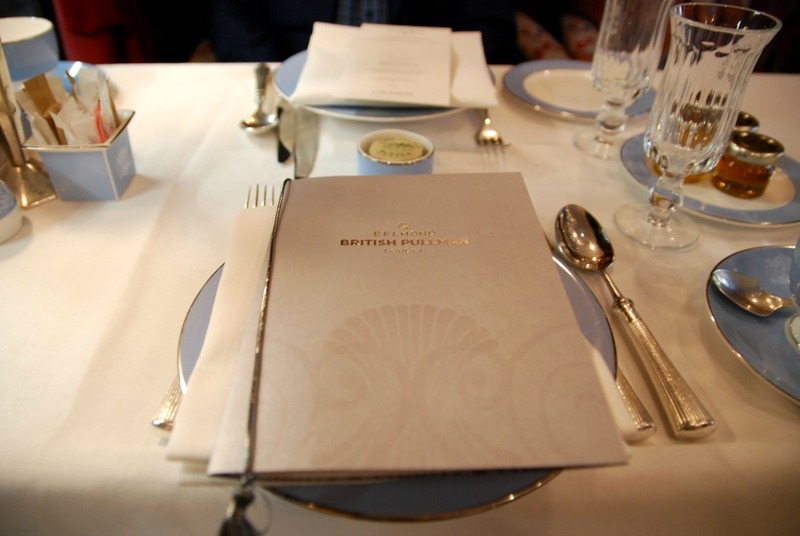 We were super lucky and were seated with two lovely couples. We literally spent the entire lunch laughing and talking non-stop about food, travel, and our favourite places! Food-wise we started with a cauliflower soup with toasted almonds, curry, and lime, which I didn't photograph, as it was demolished far too quickly. 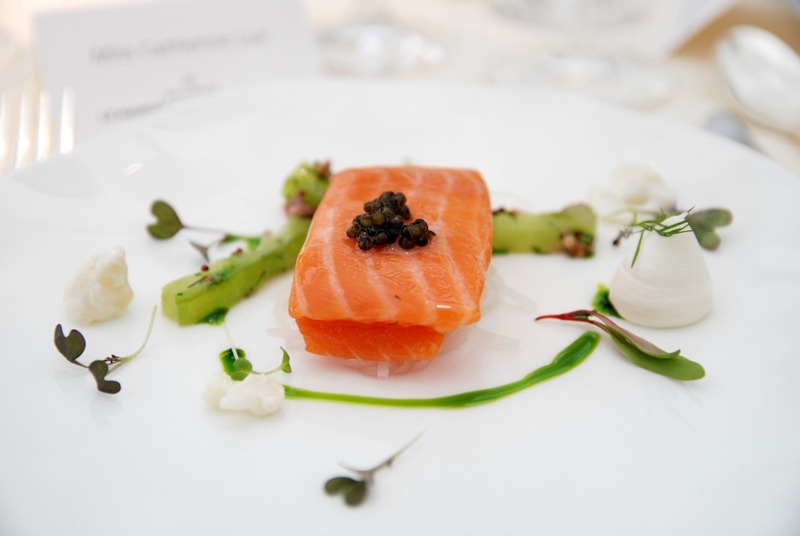 We then moved on to beautiful, fresh Sea trout with cucumber, dill, and horseradish cream. 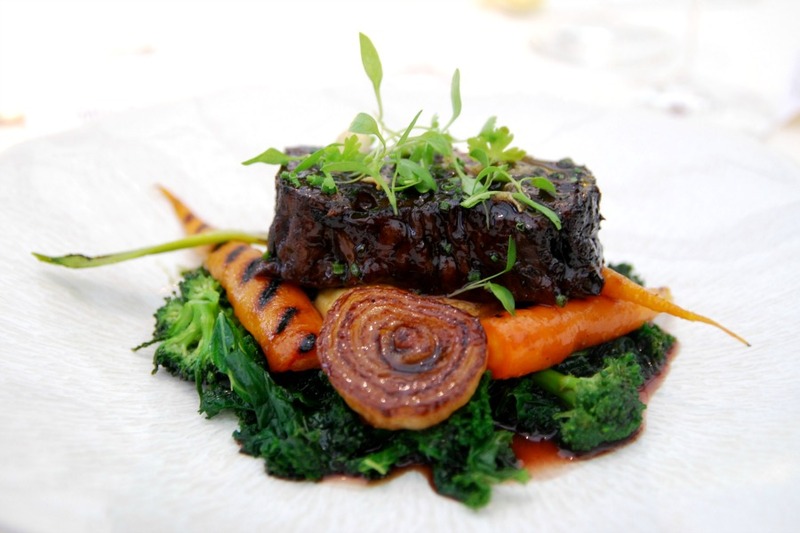 And finally we had Braised Jacob's ladder (beef) with smokey mash potato and wine essence, which was so tender the chunks of meat fell apart as soon as my knife rested upon it's juicy flesh. All six of us on the table raved about each dish, we just couldn't get over the flavours within each course. The ingredients were so simple, but the flavours were incredible! 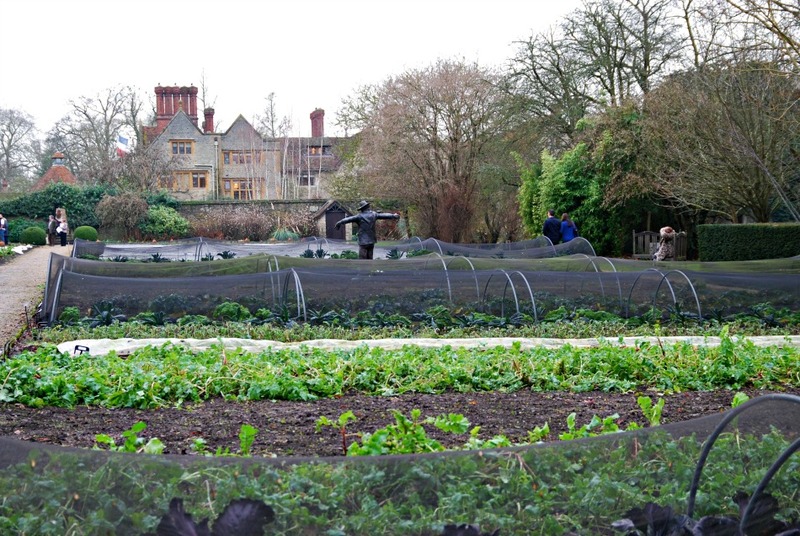 Raymond and his team grow all of the fruit and vegetables and herbs in the gardens of Le Manoir, which we toured after lunch, and he even has his own wild mushrooms underneath a bridge. To say we were impressed is an understatement. 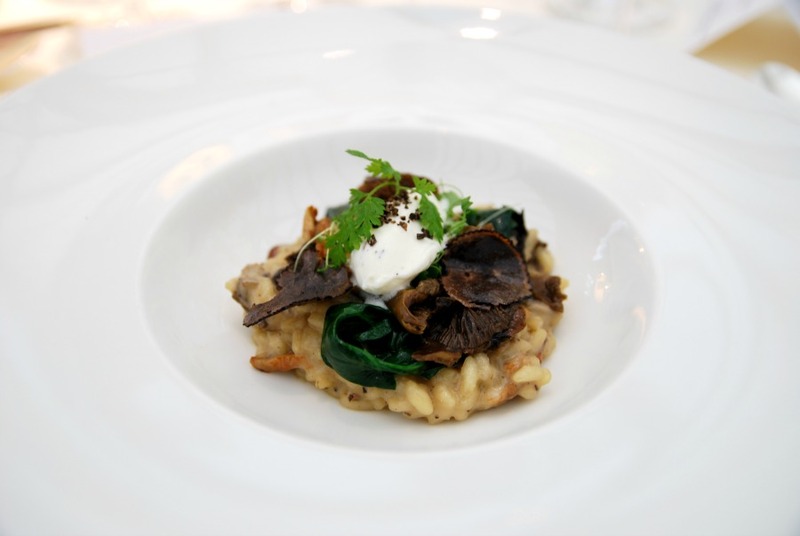 We were also lucky enough to have some pretty sensational wines to accompany the meal, with a Chardonnay 2015 Vignoble Guillaume from Franche-Comte in France to accompany the sea trout and risotto. With the beef we had a Crianza 2014 Vina Amezola from Rioja, Spain. I'm very fussy with my wines, but I enjoyed both of them immensely (the red a little too much haha). 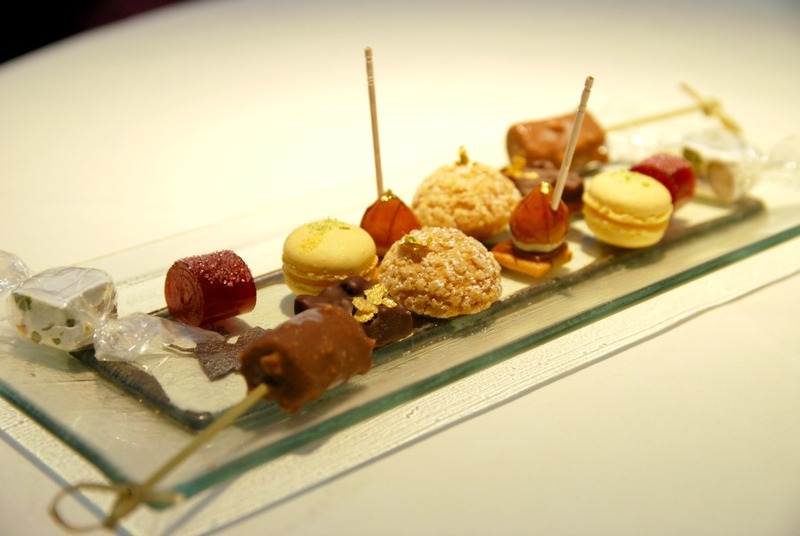 Just before the petit fours were served a commotion began, as Raymond Blanc himself entered the room! The ladies on our table and I got WAY too overexcited and were trying to figure out if we could go and ask for a photo. We decided to just go for it so ran up as he was leaving the room. As soon as he realised I was taking a selfie he laughed, but it got me the best photo haha! Raymond was really lovely, and later after the petit fours we found him again in the reception area so Dad got a photo too. 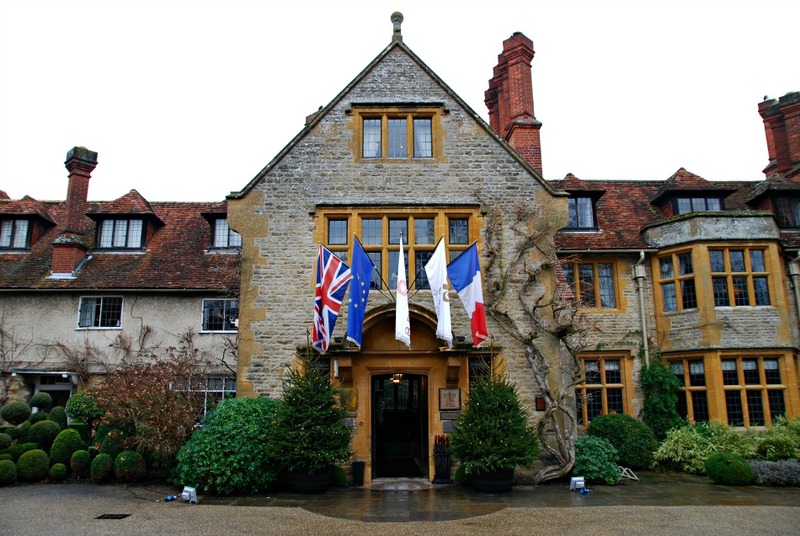 We asked the staff if Raymond actually cooks anymore, and they said that whenever he's at Le Manoir he gets into the kitchen to help the team cook and prepare for the lunches and dinners. 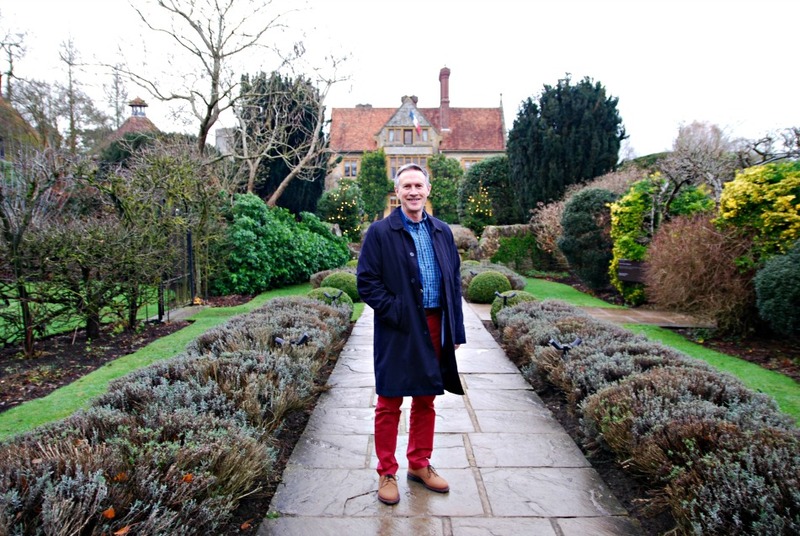 You may remember that I visited Le Manoir as a guest for a cooking class and afternoon tea a couple of years ago, so I'd already seen the grounds in the summertime. 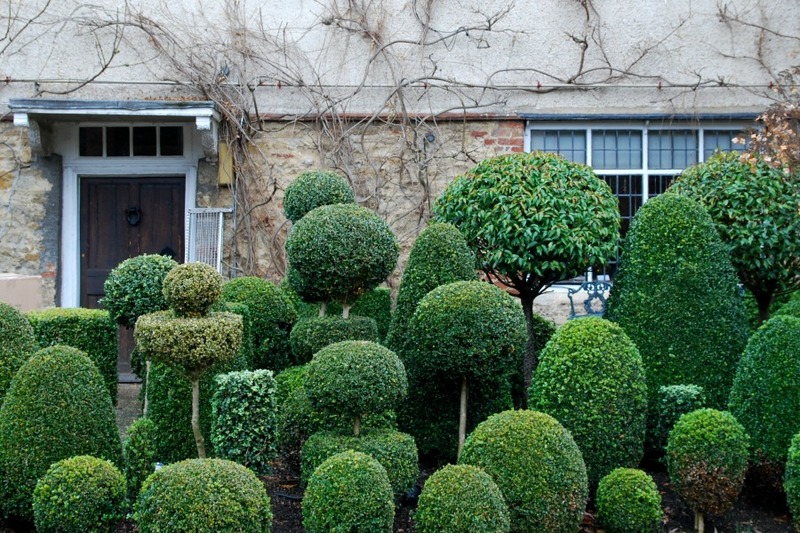 In winter they were much more sparse and not as lush and pretty, but still so impressive with the huge variety of herbs and veggies. Dad used to have an allotment for years, so he loved seeing the layout and how they were growing certain things. After a wander and some photos it was time to head back to the coach for our journey back. We were caught in evening traffic getting back to Oxford station, but despite being 30-minutes late for the train they held it for all three-coach-loads of us and we departed Oxford after a 15-minute wait at the station for the next Platform slot. 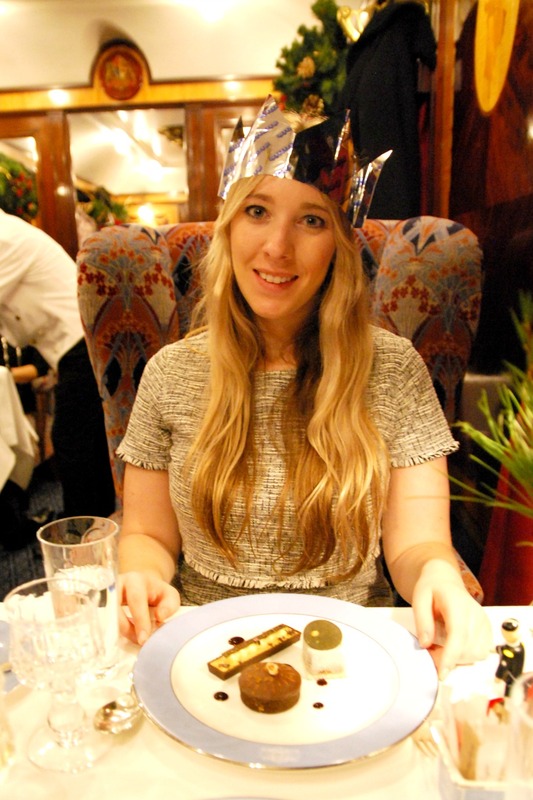 The train journey back was one filled with napping from a food coma, and eating more...this time dessert. 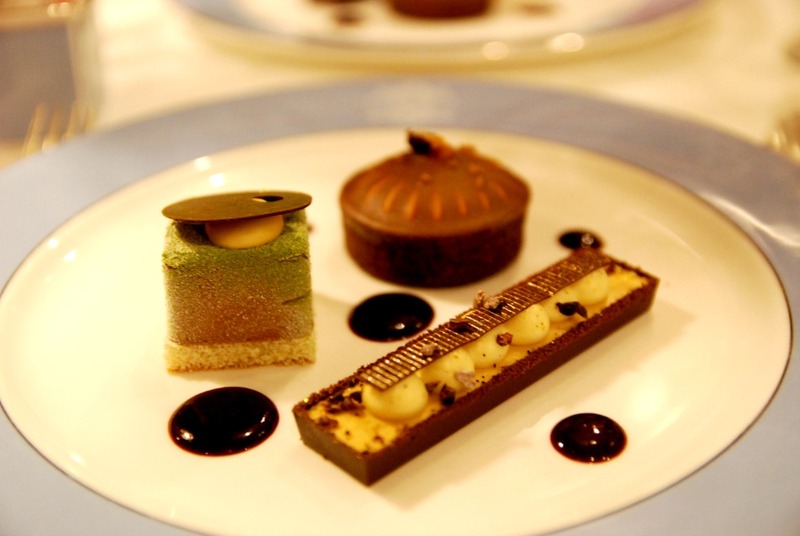 We didn't just have one dessert though, but THREE EACH. 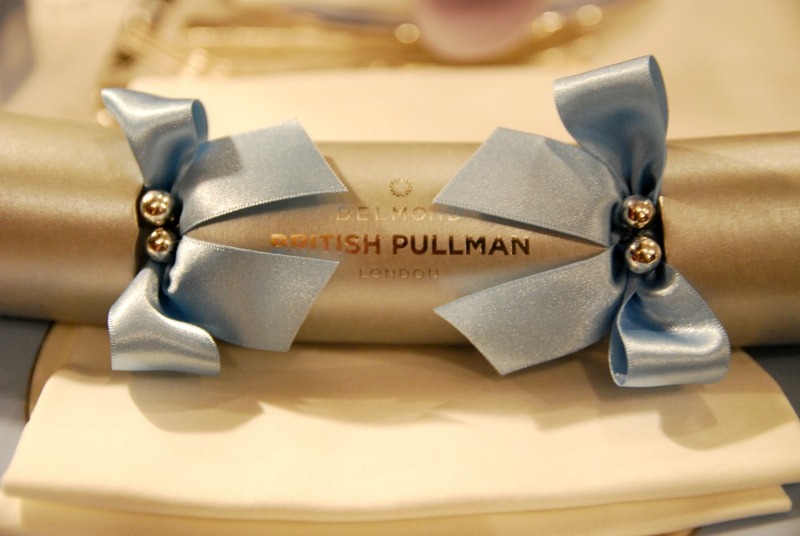 We also had a Christmas cracker with dessert because it was just a few days before Christmas. And as the day drew to a close, I couldn't help but wondering, how on earth did we go from such elegance and comfort, to the shambles of today's trains? 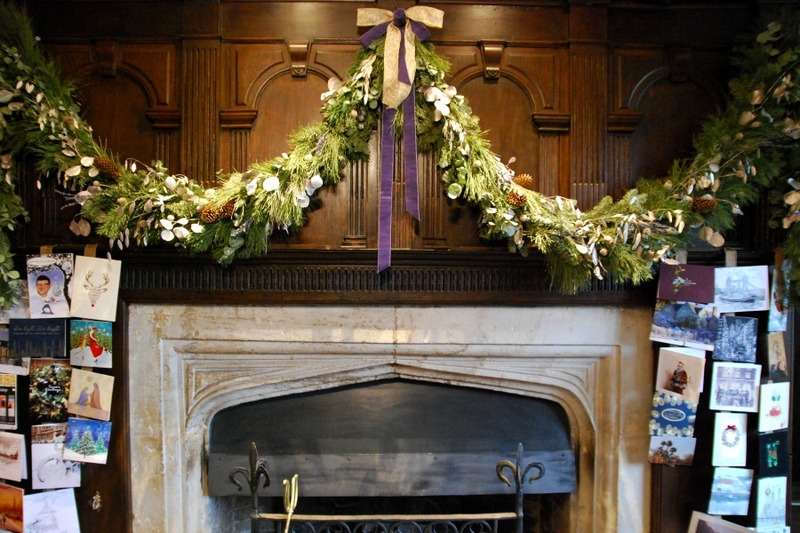 The entire day was one of luxury and decadence, and we loved every minute! 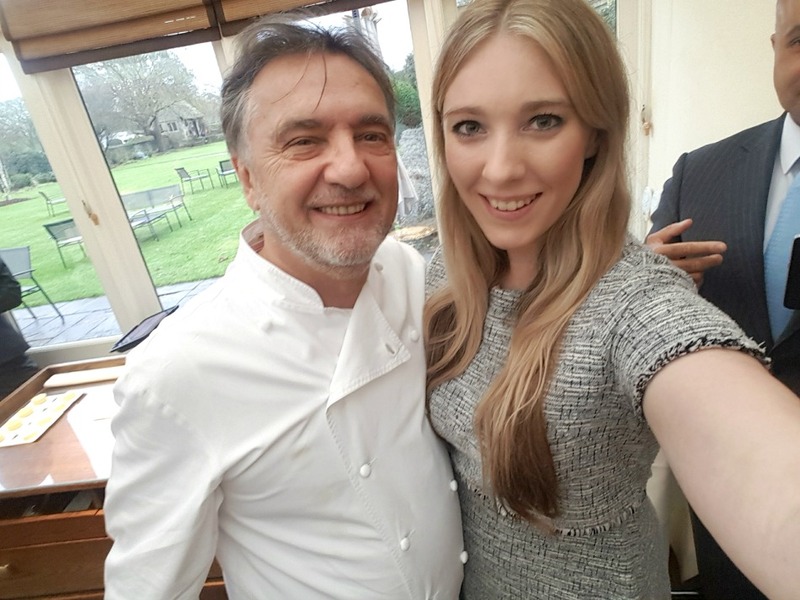 The food was just incredible, the whole experience was magical, and obviously meeting Raymond Blanc was just the cherry on top of an exceptional day!! 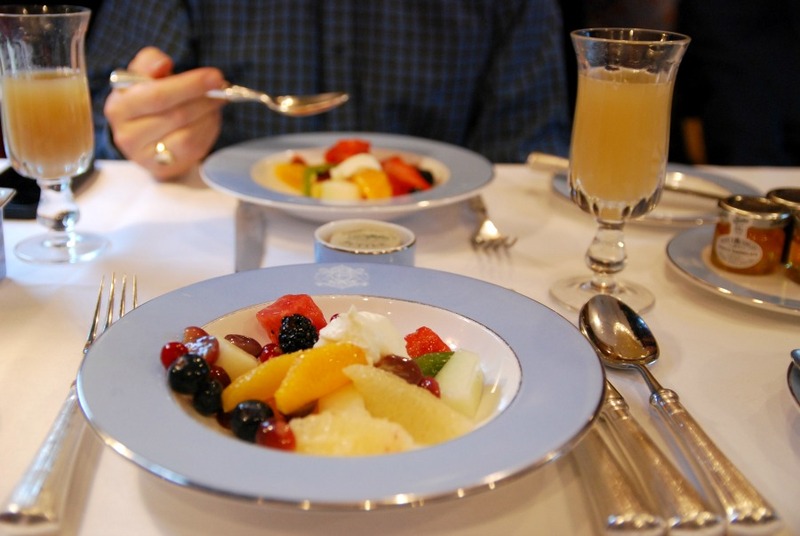 I adore how Belmond provide such boutique and unique experiences, from my stay at the tranquil oasis of Belmond La Résidence d'Angkor in Siem Reap, to my afternoon tea and cookery class two years ago, to this train journey to Le Manoir...every time I have an experience with them it's just perfect. I really don't know how they manage it. 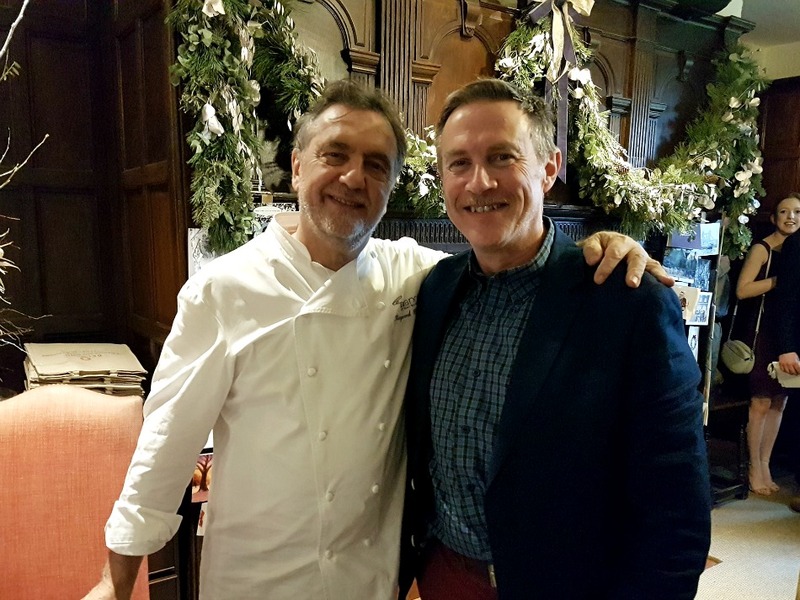 A huge thank you to Chef Gary Jones, Raymond Blanc, and their team for providing us with such a delectable feast, and to Belmond for yet again, providing another memorable experience! 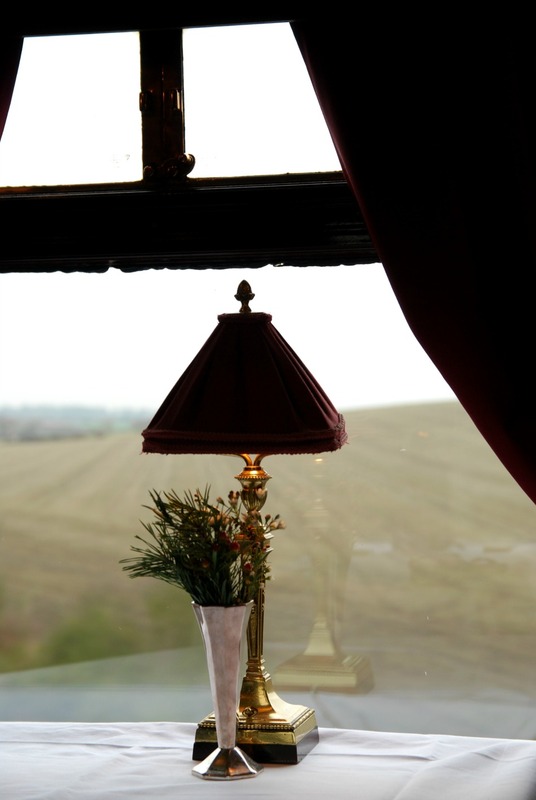 I'm not entirely sure how I will cope with travelling by normal train again, and I'm a little scared to get back onto a South-West Train after my British Pullman journey. 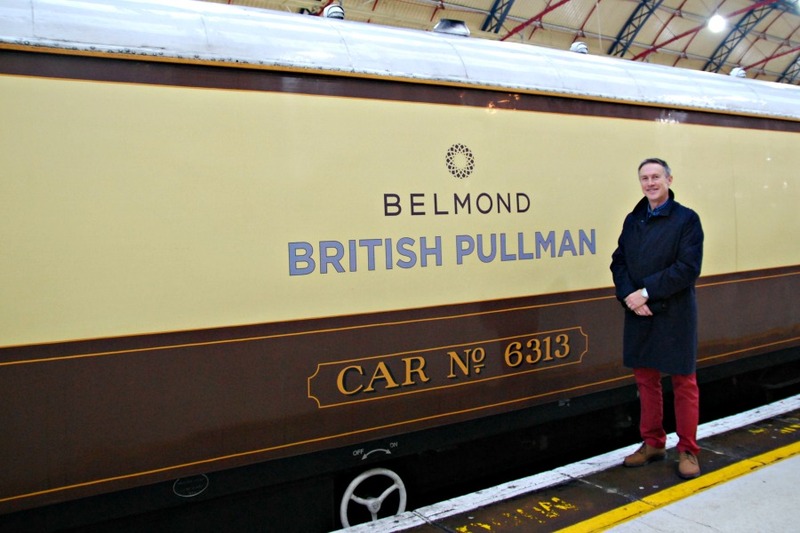 Have you ever been on the Belmond British Pullman or stayed in one of their hotels? What a wonderful gift for your dad!! 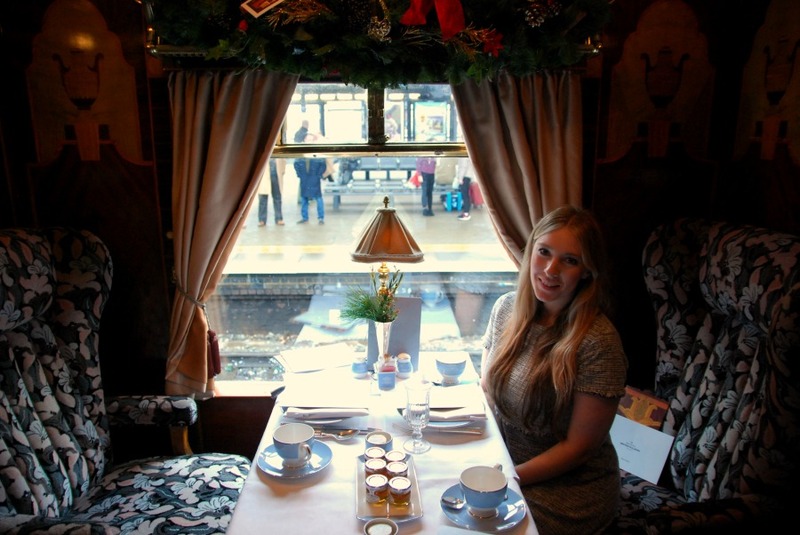 I went on the Belmond Pullman with Lauren last year. 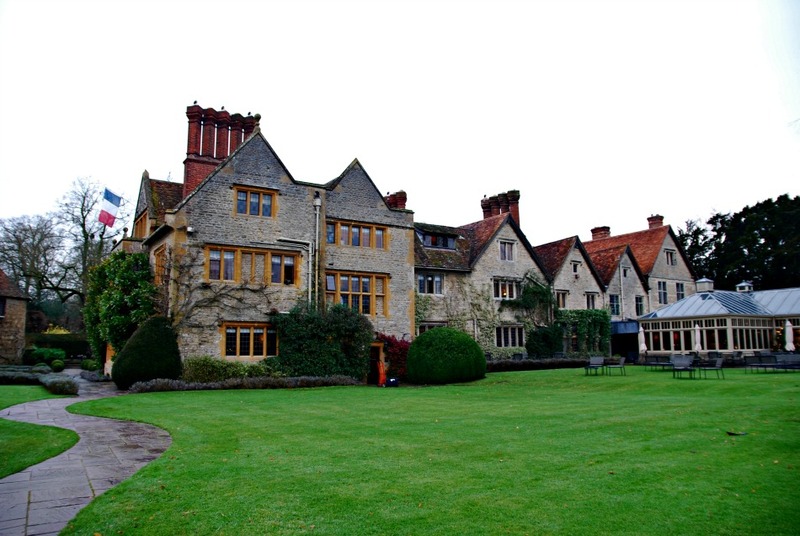 I stayed at Le Manoir about ten years ago lol!